Well hi there! I’m Anna, a 25 year old good-food-junkie and wanna-be-runner. After about a year of lurking around various healthy living blogs, I decided to start my own to keep myself accountable! I suppose that if I stop to think about it, I have been dieting all my adult life. It took starting a new phase of my life in a new place to realize that what I needed wasn’t a diet, but a lifestyle change. 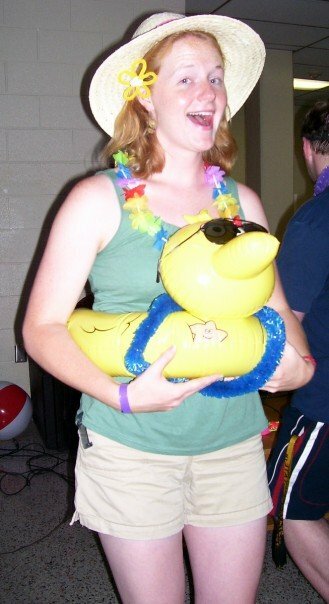 Summer of 2007: I worked at a summer camp - I don't always wear a Big Bird floatie around. I graduated college in 2007 at one of my lowest weights ever. I was 5’7″ and about 155lbs. My weight wasn’t out of hand, but I also wasn’t happy with the way I looked or felt most of the time. Living in DC led me to believe that I could eat anything I wanted because I was walking everywhere. Grad school also threw my eating habits off and I found myself eating two dinners: one before class and another after. Six months after moving up, my clothes weren’t fitting right and I was frustrated with how easily I got tired. With the scale was pushing 180, I decided it was time for a change. I joined Weight Watchers for about a year, started moving more and eating less. I kissed full fat foods goodbye and started learning how to cook so I could prepare better meals. Weight Watchers helped me rethink my proportions and what I was putting in my mouth. It also helped me get down to mypre-DC weight. However, after about eight months the “points” started making me feel guilty. 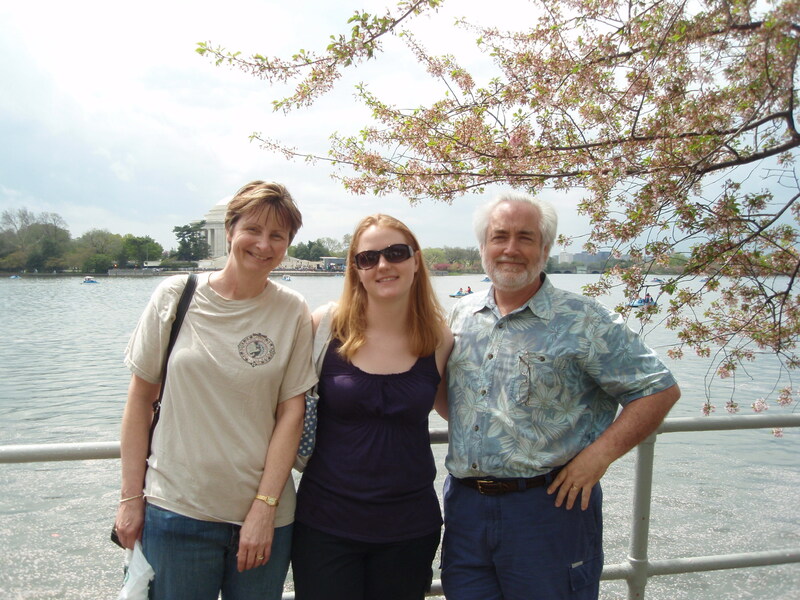 April 2008: With my parents right before I started Weight Watchers. I decided I didn’t want to have to worry about the “points” for fruit and vegetables. A banana or an apple should never make me feel guilty. I started to focus more on eating good things and exercising. This was also about the time that I discovered food blogs! I cannot explain how much these bloggers motivated me and pushed me to try new things (food, work outs, mindsets). 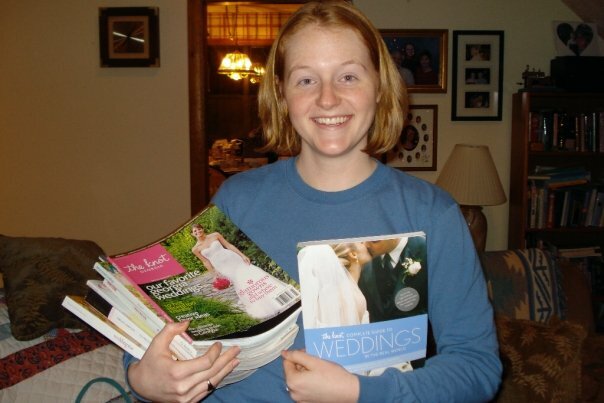 December 2008: Just after getting engaged and about 20lbs lighter. Thirty pounds lighter than when I started, I have no plans to stop! I want to continue to feel healthy and I want to feel more athletic. This is my journey to continue the healthy lifestyle I’ve tried to ingrain upon myself. I work behind a desk 40 hours a week and am a reluctant runner. I love good food (and a lot of not-so-good-for-you food) and enjoy a tasty beer. When it comes to my health, I find that I have great intentions but not as great follow through. My hope is that this blog will keep me accountable and serve as a motivator for me when I drag. 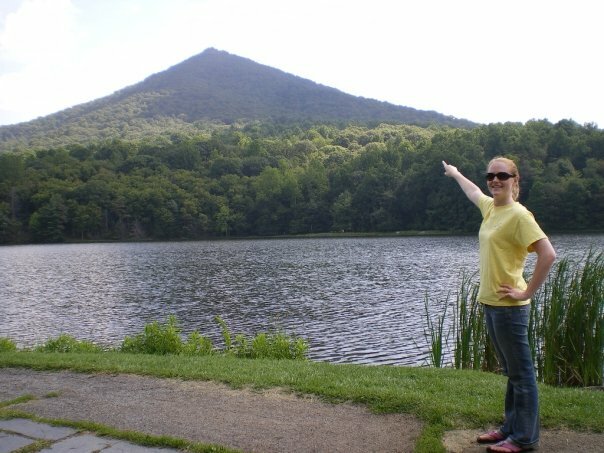 Peaks of Otter, VA in August of 2009: Climbed a mountain that would have killed me a year before. Other things about me? Let’s try a list (cause I love those): only child. married my best friend on 03/27/10. type-a. did my undergrad work at the greatest university on God’s green earth (University of Georgia). got my masters at George Washington University. will read anything I can get my hands on. like the idea of being a runner more than running itself. blessed beyond measure with wonderful (and supportive) friends and family. It’s nice to meet you, Anna! I too am a wannabe runner! 🙂 I look forward to reading your posts! It’s unbelievable how much I can relate to you just by reading your about page…I can’t wait to read more of your blog! Weight Watchers, though I was an unofficial member, did get me thinking about portion sizes but I agree 100% that it sort of took away from recognizing the value in the food from the earth. When your more likely to choose a 100 calorie package of oreo think cookies over a banana purely because of the points, there is something wrong there! You’ve got a new reader! First time on your blog and can’t wait to read more!! I connected so much to what you were saying because I am a constant dieter, and have started blogging to 1. explore healthy, productive eating habits 2. my hubs and I are a military fam so we wanted to share our lives/stay connected with loved ones and 3. learn more about myself in the process! I was in Weight Watchers as well, and as much as it helped, it obscured my vision to with the points system…thank you for putting yourself out here on the web, and looking forwad to more! !